Why do international students choose a certain university or school? Major factors are word-of-mouth and an institution’s prestige – influential especially for the many students who aren’t able to visit a campus before applying. These students tend to have more contact with schools with generous marketing budgets and so greater international reach and visibility. But a new digital marketing technique is helping to level the competitive field with respect to international recruitment: the virtual campus tour. This ICEF Monitor article looks at the trend and how universities are using virtual campus tours to help convert prospective students into enrollees. Endri Tolka, an Albanian graduate of Brandeis University, recalls that he chose his university because his older brother had gone there. He went there without having visited any schools, including Brandeis, because he simply couldn’t. Mr Tolka’s experience is far from unusual for international students, and it also gave him the germ of the idea for the business he would create: YouVisit, a company for which he is CEO. When we last wrote about YouVisit in September 2012, the company had a base of 150 client-schools. Two-and-a-half years later, it now works with more than 1,000 universities around the world to create virtual campus tours. YouVisit is just one of the companies now helping schools in various countries to recruit students via digital, virtual experiences. 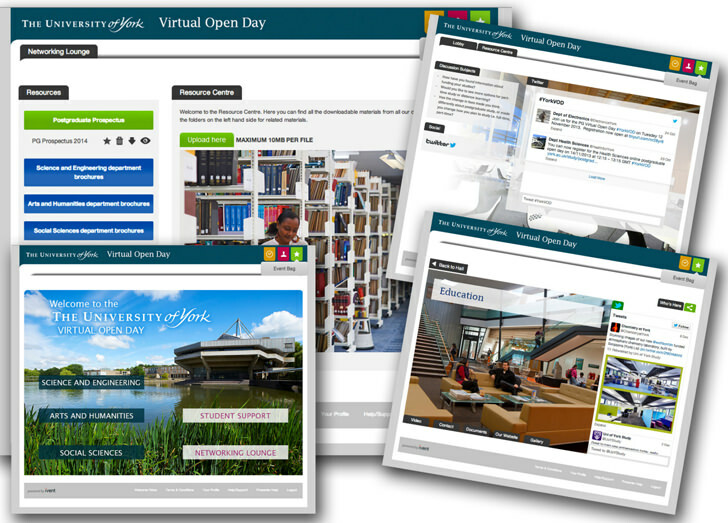 UK-based Ivent, which specialises in “virtual events,” is another, as is the US-based platform CollegeWeekLive which offers live web chats and virtual college fairs. Most such sites also offer a ready portfolio of existing tours and virtual events that you can review for inspiration and ideas. And sessions that connect far-off prospective students with alumni to ask questions. Reach all these students via a single tour or event. They can do all of this repeatedly (i.e., students can take a virtual tour as many times as they like), at any time (24/7) and are ready-made for sharing – as students can easily pass tour links to other students, to their parents, to their teachers, etc. There is evidence that students are beginning to see schools’ provision of virtual experiences as essential. 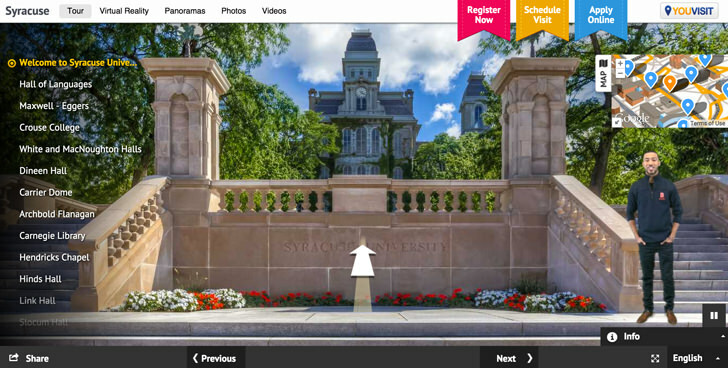 The college search website Cappex released a report in 2012 that revealed virtual tours to be the top tool students used to initially evaluate a campus. 36% of students said they would “really like” for colleges to offer virtual tours as a way of introducing them to the school campus, and 30% called them a “must have.” And that was 2012 – students’ expectations for the provision of virtual tours can only have grown since then as more institutions have introduced expanded options for virtual visits. In some countries, there is a limited set of international educational brands that can pay for the most talented, high-achieving students to come visit their campuses. They know how compelling these visits can be, and by making it possible for top students to visit, they are better able to attract them. These smaller schools can be frustrated in their offline marketing efforts due to larger brands’ established presence and reputation in their target markets, and online strategies can help them break through to prospective students they otherwise would have trouble reaching. For example, Royal Roads University ran a 2014 campaign that let prospective students virtually attend lectures, tour the campus, and participate in Q&A sessions with professors in real time. Royal Roads students served as tour guides – tour guides equipped with Google Glass (a product since discontinued) and a GoPro video camera. They attended lectures and walked around the campus while live streaming their activities. It was all recorded, and you can view the results here. The campaign’s initiator, Catherine Riggins, director of branding, marketing, and recruitment at Royal Roads, said the university’s decision to offer a virtual experience was prompted in part by past marketing campaigns that hadn’t yielded enough conversions. Ms Riggins also noted that a key benefit of digital marketing – the ability to track user visits and behaviour – was inherent in Royal Roads’ virtual experience campaign. He says that other challenges, such as “how to respond to multiple people on a chat in a single space, how to control a conversation online, steering event attendees to the correct space and content, and managing support issues” are items that can be handled by any good virtual event company. Finally, in this age of integrated marketing, it’s important to remember the excellent opportunities that exist to link virtual tours with SEO, social media, admissions/prospect management, and other elements of an overall recruitment effort. This entry was posted in Africa, Asia, Australia/Oceania, Europe, Higher Education, Marketing, Middle East, Most Popular, North America, Regions, South & Central America, Technology, Youth Trends and tagged college admissions, study abroad, alumni recruitment, online marketing, education abroad.